Creative Sewing & Smocking > Patterns > Babies > Classic Charlotte Daygown and Dress sz NB-3yrs BACK AGAIN 2015! 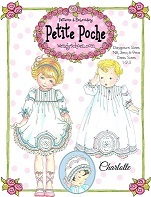 The adorable Classic Charlotte for newborns thru 3years is BACK AGAIN! Daygown or blessing gown, plus a little girl's adorabale matching dress with 3/4 length sleeve dress and lots of exquisite embroidery work.